I recently acquired the scanner listed above, sans serial cable. I sent off a note to Uniden asking for information on the cable and where I might get one. Their reply (which took a while) was basically (paraphrasing) "we don't carry it anymore, don't bother us". I attempted to find one on line elsewhere and did succeed but being the cheapskate that I am, I did not want to pay $30+ for one. No one makes a USB cable that will work with this scanner, it is serial only. There are some that look like they will work, but the scanner connector is for a later model scanner. The cable end that connects to the scanner is not a standard connector. Trust me the standard small usb connectors will NOT fit. Do not attempt to use any regular USB cable to connect the computer to the scanner it will fry the scanner and could brick your computer. I found a website in Russia that had some vague instruction on how to make the cable, I refined those "instructions". 1 - USB Cable for the Fuji FinePix 2300, 2300Z, 2600, 2600Z, or 2500 camera, ebay has them for about $7.50 (including shipping). 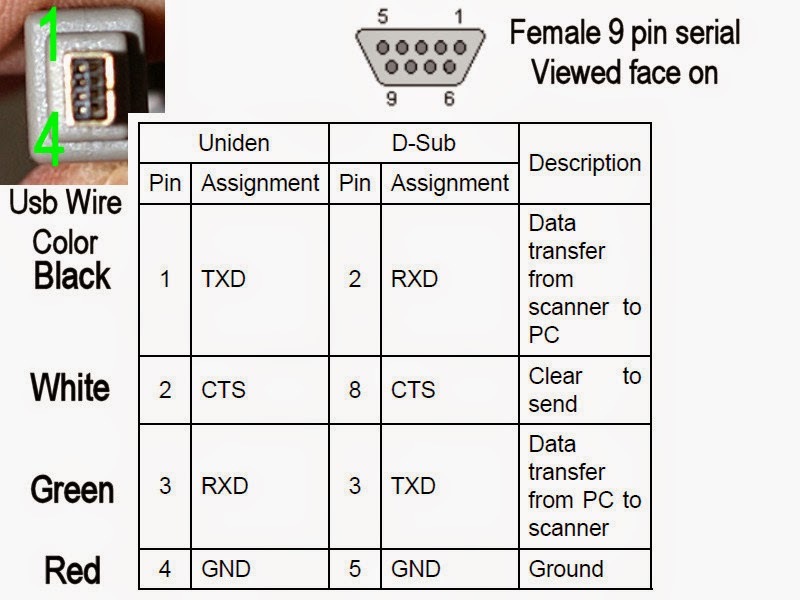 1 - 9 pin female serial connector. 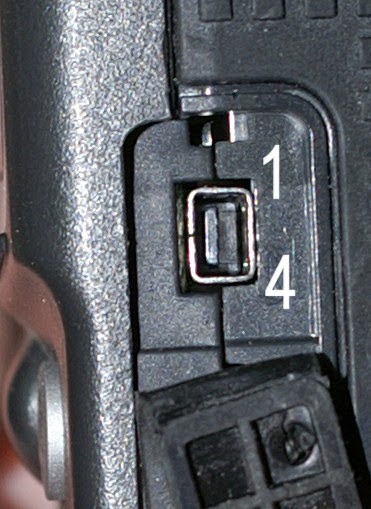 This is the connector on the scanner (pin numbering marked). The Fuji camera cable connector is in the picture further down. Cut the large "type A" connector off of the USB cable, solder the 9 pin connector to the USB cable using the picture below as a guide. I would double check the information below as wire colors may not be the same. I used the continuity function on my volt meter to verify everything was correct. Now for the bad news. The Serial cable may only work with a real serial port, not a USB to Serial. My U232-P9 converter would not work. It would ALMOST work, but the Uniden software is flaky and does not have much in the way of settings. I got mine to work with a laptop I have that has a real serial port. 57600 Delay time setting was set to 0. Configure your port in device manager to the same BAUD rate, 8 data bits, no parity, 1 stop bit, no flow control. check the Uniden scanner manual on how to configure the scanner with the correct BAUD rate, page 60. The manual, and software are still available from Uniden to download, and there may be other third party software that can be purchased.